Join us for this fun get together and enjoy a delicious Irish style meal followed by a bingo. Please purchase tickets by March 11. 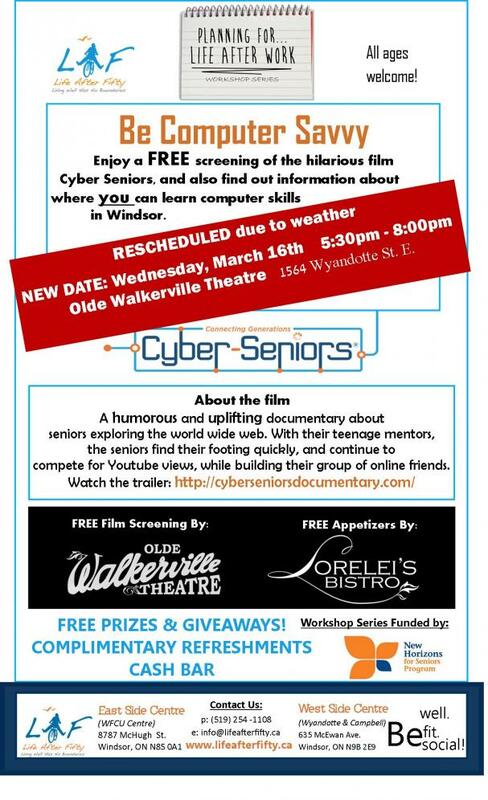 Enjoy a free screening of the hilarious film Cyber Seniors, and also find out information about where you can learn computer skills in Windsor. Part of the 'Planning for Life After Work' Workshop Series, offered by Life After Fifty, funded by New Horizons for Seniors. Let's celebrate St.Patrick's Day with a bit of green and delicious traditonal Irish style meal & Leprechaun Fizz. Feel free to stop by at the end of the rainbow and try your luck in our Leprechaun Bingo. Learn how to video chat with loved ones and friends from around the world. Participants must already have an email address created. Please register at reception. Limited space is available.